Whether you just plan to launch your retail business or you have the one already and wish to give it extra online exposure, it is high time to create an eCommerce website. A visually-appealing and functional online store will not only make your products and services available on the web, but it will help you withstand niche competition and generate profit. As soon as you launch a web store, you’ll notice the increase of customer base and the growth of sales. These two factors are interrelated and the better the performance of your eCommerce website is – the more clients will be eager to buy from you over and over again. If you are not a web design pro, you don’t have many web building options to create an eCommerce website from scratch. The most suitable variants are CMS and website builders. Content Management Systems (CMS) are web-building programs, which have an extensive choice of tools to launch and manage different types of websites, including online stores. These services are quite popular today, because they allow creating functional, well-structured and appealing websites that attract the attention of users and provide a wide array of options. CMS ensure convenient content publishing and editing features. They also imply the possibility to enhance website performance by installing extra plugins compatible with the system, but this may require specific web design skills and knowledge. Website builders are simpler as compared to CMS, but they also ensure quick, easy and convenient web building process. These systems are generally user-friendly and understandable, which ensures quick, effective and simple web building process. They come with tutorials and manuals that help solve many web design problems. By using website builders, you can launch a functional online store in less than a couple of hours. Let’s have a closer look at both types of systems to decide, which one meets your web building needs most of all. How to Create an eCommerce Website with a Website Builder? Registration with the Service. Having selected a website builder, you’ll have to register with it first. This is a must-have step all the systems offer. The sign up process is generally simple and quick. You’ll just need to provide your email and make up a password to register with the system. Some services send confirmation emails to let you create an account. Another option is to register via your Facebook account (I think you have the one). This doesn’t take much effort and time as well. Template Choice. Having signed up for the system, you will be offered to select a template that suits your niche most of all. Most website builders divide their templates into thematic categories to simplify the template choice. This helps save your time and effort, making the process of template selection more effective and quick. Templates may be paid and free, so, it’s up to you to decide on the most suitable option. Design Customization. Right choice of a template is only half of the task. The major and the most responsible part is design customization. Website builders generally offer a rich set of customization tools, which can make your online store both functional and appealing. You can modify your website color palette, fonts, backgrounds, icons and other elements to get the desired result. That’s an engaging experience for everyone. Creation of Product Cards. Having customized your website design, you may proceed to the creation of product cards. The number of cards you can create depends upon the number of products you plan to sell and the number of cards your plan allows you to make. Website builders may offer free and paid plans, each of which may come with certain terms and restrictions. The latter may also concern the product amount, so, make sure to choose the most suitable plan right from the start. When creating a product card, take your time to add the photos of a product and its detailed description so that your customers could know its specifications. Setup of Payment Options. Having finished creating product cards, you’ll need to set up the payment options. Their choice depends upon the system requirements as well as upon your own preferences. You can offer your customers several payment options to choose from, but do not forget to add their terms. Setup of Shipping Options. Setup of shipping options is as important as setup of payment terms. Provide all shipping details and terms in a special section accessible to your customers. Mention all the services you are ready to offer and their cost. Don’t forget to specify the countries you ship your products to. Domain Name. The choice of a domain name is one of the most crucial stages of the entire website design process. Most website builders offer plans that come with free domain name and hosting included. This eliminates the necessity to look for a domain name elsewhere, focusing on other essential nuances. Make sure your domain name is memorizable and represents your online store to the advantage. Generally, options are multiple. So, don’t hurry up to make the right choice. Website Publication. Now, as your eCommerce website is ready, it is high time to publish it on the web. This is easy, quick and allows enjoying the result in less than no time. There is a variety of eCommerce website builders available nowadays. Having explored and tested dozens of services, I have compiled a list of the best platforms used to create eCommerce websites from scratch. Shopify is, probably, one of the most renowned and reputable eCommerce website builders, the popularity of which keeps increasing with every passing year. If you plan to create a large online store with multiple product cards and eCommerce options, this service will certainly come up to your expectations and requirements. The website builder offers a broad spectrum of features a user needs to create an online store. Shopify supports the multilingual feature, which allows creating different language versions of your online store. This is a benefit for users, who plan to deal with foreign partners and customers. The service uses the advanced Point of Sale (POS) software, which offers numerous benefits, including offline customer order acceptance, multiple stuff account creation, integration with accounting software and more. 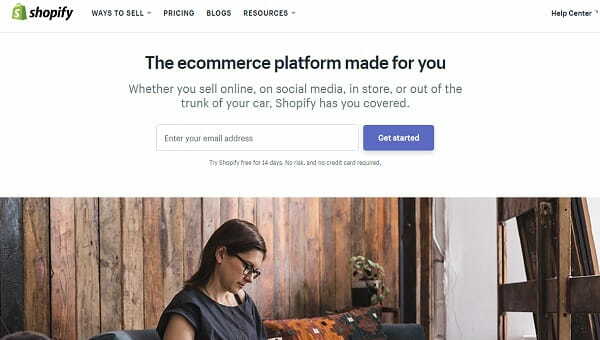 If you wish to connect an online store to your ready made website, Shopify allows doing that with a few clicks only (by integrating the Buy Button feature). Among other eCommerce advantages the system offers, it makes sense to mention powerful accounting functionality, synchronization with external services like Amazon Marketplace or Quickbooks, abandoned checkout recovery, blogging opportunity with the Future Publishing feature, SSL certification etc. Shopify comes with a rich template gallery, offering dozens of categories that can come up to your requirements and niche specialization. The templates are free and paid and there are also lots of customization tools to create unique and appealing website design. Whatever template you will go for, it will feature high quality. As to the pricing policy, Shopify has plans for everyone. They are not quite expensive, although, the advanced plan is more costly as compared to the rest of the options. The system has a free 14-day trial period that makes it possible to test the plan you are interested in. Paid plans include Lite Plan ($9/mo), Basic Shopify ($29/mo), Shopify ($79/mo) and Advanced Shopify ($299/mo). Each plan differs in the terms and restrictions provided. Check them out before making the choice. Shopify is a website builder that will cover the entire spectrum of your eCommerce web building needs. The service is known for its powerful functionality, ease of use, convenience, credibility, safety, multiple options and affordable plans. 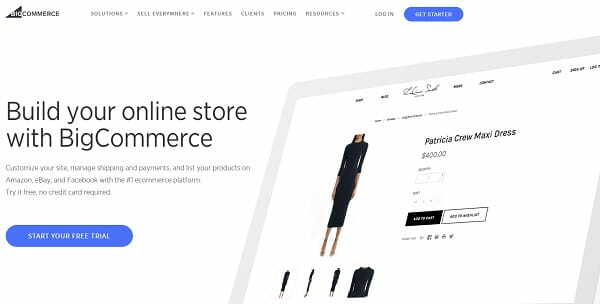 If you wish to launch an online store that will be the embodiment of style, functionality and great visual appeal, this solution is definitely on the top of the list. Wix is a universal website builder, which comes with powerful eCommerce functionality. The service is used to create different types of websites and it can also be chosen to develop an online store, which will impress you by its design and performance. 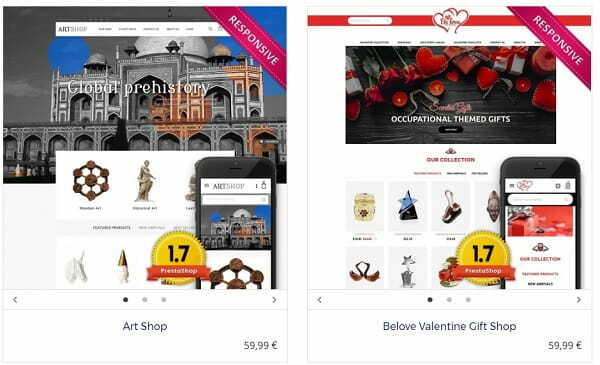 Wix is initially known for its App Market with multiple eCommerce apps to be integrated into your online store to enhance its functionality. The website builder ensures simple and effective online store management by making it possible to create and customize eCommerce websites, track order details, manage inventory lists, set product details, send notifications to customers etc. To enhance your product presentation, Wix allows creating and managing product galleries with full-size images and detailed descriptions. Finally, the website builder ensures safe payment options, taking care of the reliability and security of each transaction made in the system. Customers are offered to choose payment options that are the most convenient for them. The system abounds in high quality free templates and eCommerce themes deserve special attention. 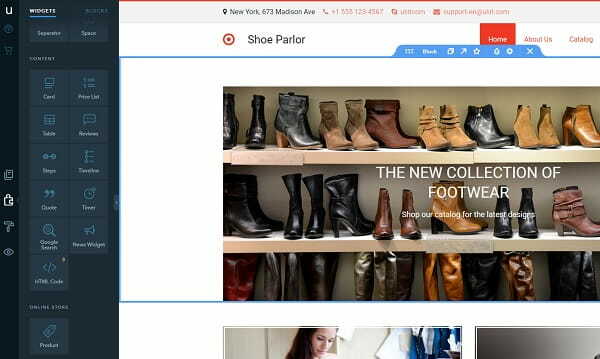 They can be used to build online stores of different types and sizes. There are also powerful design customization tools that contribute to the visual appeal and performance of eCommerce websites. As a universal website builder, Wix offers affordable pricing policy. When it comes to building eCommerce websites, the service has two plans suitable for this purpose. These are eCommerce ($16.50/mo) and VIP ($24.50/mo) plans. As to the rest of the paid plans (Connect Domain ($4.50/mo), Combo ($8.50/mo) and Unlimited ($12.50/mo)), they also allow launching and setting up online stores, but you won’t be able to accept payments with them. This is a notable drawback for the prevailing amount of business owners. If you have an idea to launch an eCommerce website, but lack skills and experience to do that on your own, then using Wix is a pretty good idea. The website builder is simple even for newbies, which, however, does not affect its functionality. It comes with a drag-and-drop feature, powerful eCommerce options, affordable plans and variety of niche templates to choose from. This is a decent solution that is worth consideration. 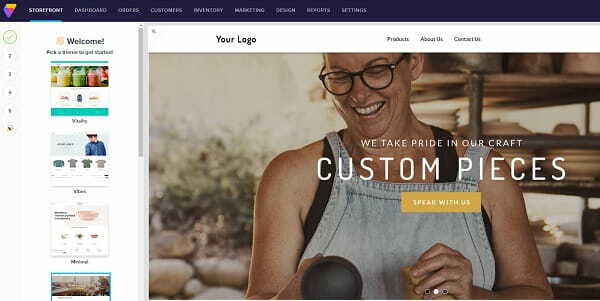 Wix eCommerce Examples – Take a look at real Wix-powered online stores. BigCommerce is a specialized eCommerce website builder, which works great for launching medium/large and powerful online stores. The system may seem a bit complicated for non-tech savvy users, but if you manage to master it, you will be satisfied with the result. Web design pros as well as users, who have ever worked with website builders before, won’t find the system too complicated and will be able to master it in a few days. 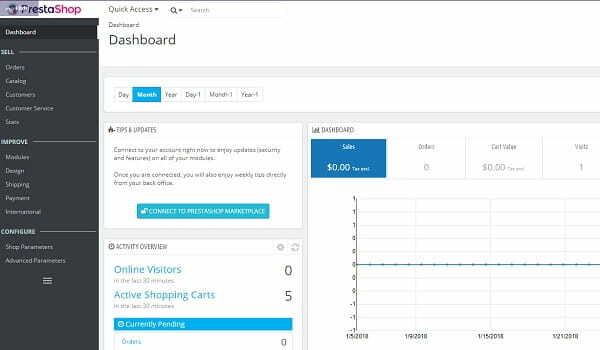 BigCommerce has an intuitive and logically-structured dashboard, but it has many settings you have to learn in order to start working on your eCommerce website. The website builder offers multiple eCommerce options that can boost your online store performance. It makes it possible to trade via Facebook, which implies the installation of a free SocialShop 2 application, as well as at different well-known platforms, such as Shopzilla, eBay, Beso etc. You can setup email marketing options, manage your inventory list, add and manage products, organize the return/exchange system, create gift certificates and ad banners, upload multiple products from CSV-files and perform other actions to make your online store functional. 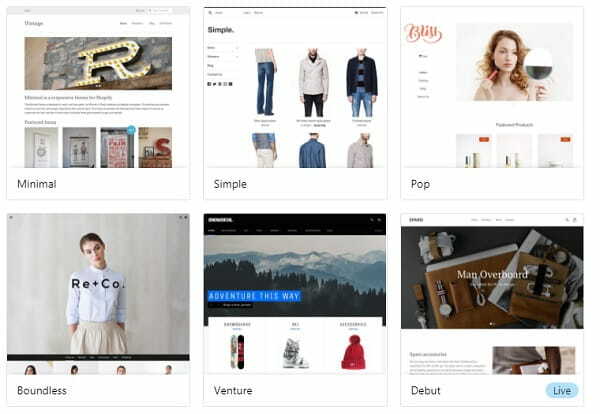 BigCommerce has 7 free templates and dozens of paid themes. The quality of free samples is worse than that of paid templates. However, the cost of paid templates is above the average and constitutes from $145 and up to $235. You can sort out the templates by their categories to select the most suitable option. If you have your own template, you can upload it to the system as well. Once you have chosen a template, you won’t be able to change it, while working on your website. Otherwise, all the submitted content will be lost. Mind this nuance, when making the choice. The website builder allows testing the paid plan you are interested in for 14 days absolutely for free. After the end of the trial version, you’ll be able to upgrade to one of the paid plans, namely Standard ($29.95/mo), Plus ($79.95/mo) or Pro ($249.95/mo). There is also the Enterprise Plan here, the cost of which should be discussed individually with the system manager. Mind, however, that there is one important nuance about BigCommerce pricing policy. This is the yearly profit limit applicable to all the paid plans, except for the Enterprise Plan. It means that each $200000 of your profit will result in the $150/mo increase of the cost of the paid plan you use. If this is ok with you, then you can start using the system right away. BigCommerce is a decent eCommerce website builder, which offers a broad spectrum of features and options required to launch a powerful online store. The system doesn’t have any serious drawbacks. Instead, it offers niche templates, multiple design customization tools, online store settings, SEO and marketing options as well as integration with renowned trading platforms. This is more than required to launch a large online store. BigCommerce Website Builder Review – Read the complete BigCommerce review for more information. BigCommerce vs Shopify Comparison – See the detailed comparison between BigCommerce and Shopify Store builders. uKit is one of the easiest and the most popular small business website builders, which is known for its powerful web customizations tools and features. It is worth the attention of users, who plan to open small-to-large eCommerce websites. It ensures quick and effective web building process, which triggers decent result. uKit is a nice choice for non-tech savvy users, who have never launched eCommerce websites before, but need a full-fledged online store to present their retail business on the web. The service is super easy and intuitive. It comes with drag-and-drop functionality, intuitive dashboard, variety of widgets and apps to be integrated into your online store. The website builder offers an opportunity to connect the SSL Certificate to an eCommerce website to enhance its safety level and preserve the confidentiality of your personal and business data. With uKit, you can integrate the AmoCRM widget into an online store with a few clicks. The widget allows tracking your customers’ activity, managing their orders and the tasks of your team members. 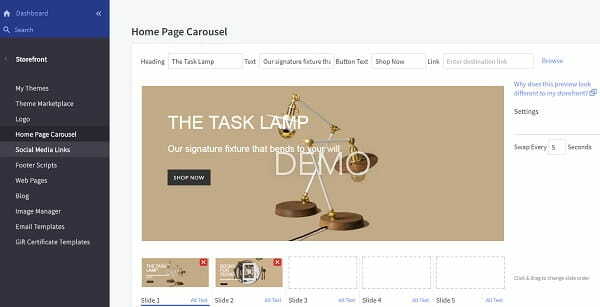 It has a rich gallery of responsive templates, where you can also find an eCommerce section. You can create an online store in two ways here either by choosing and customizing an eCommerce template or by integrating a special eCommerce widget into the theme you have selected. uKit allows changing templates on any stage of the web building process. This feature is a benefit for most website owners, who decide to create online stores on their own. When it comes to the pricing policy, uKit doesn’t have a free unlimited plan. There is a free 14-day trial version, which makes it possible to test the paid plans to find out their main features, pros and cons. Plans that allow launching functional online stores are the eCommerce Plan ($9.6/mo) and the Pro Plan ($12/mo). Thus, the pricing policy is affordable to everyone. uKit is a nice choice for everyone, who has the idea to launch an eCommerce website from scratch. The system is easy-to-use, convenient and affordable. It comes with drag-and-drop functionality, responsive eCommerce templates, web customization tools and other features that ensure smooth and effective eCommerce website building experience. The list of the best eCommerce website builders will be incomplete without Volusion. This is a specialized service, the use of which ensures effective and simple web building experience. 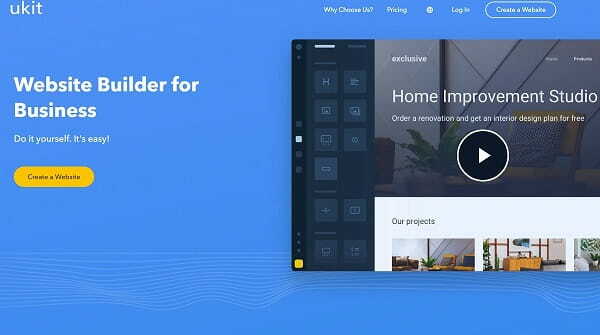 The website builder comes wide a wide array of options and features needed to launch a powerful online store that will stand out from the crowd. Volusion encompassess all the web building tools that can be effectively utilized to create and manage a small, medium or large online store. Some of them include multi-channel integration, SEO promotion, dynamic CRM system, enhanced security control, marketing and eCommerce tools, PCI certification, anti-scam protection, 24/7 customer support, informative knowledge base etc. The system is a bit complicated for users with little or no web design experience. Even though, there is no need to learn coding basics, it may still be difficult for newbies to explore and use multiple web design customization tools the system offers. The website editor allows making website design and style changes, editing the catalogue of products and online store pages. 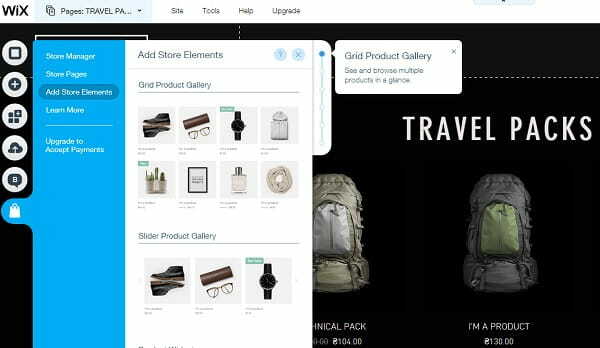 A convenient online store builder helps simplify the web building process, providing a chance to add and manage product categories and subcategories, adjust SEO settings, upload and edit photos etc. What’s interesting, Volusion comes with a set of eCommerce tools that contribute to the efficacy of online store creation process. Some of these tools are CSV file product import, barcode generator, inventory management system, warehouse setup, shipping and tax rate online calculator, advanced currency tools, simple order processing, drop shipping integration and more. Apart from that, Volusion allows connecting the SSL Certificate to enhance your online store security and it also ensures confidentiality, 24/7 website accessibility, firewall settings, PCI certification etc. The website builder offers dozens of free and paid mobile-optimized templates developed by Volusion experts. Abundance of web customization tools makes it possible to create unique designs to meet your niche specialization. As to the cost of the website builder, the system offers four paid plans. These include the Mini Plan ($15/mo), the Plus Plan ($35/mo), the Pro Plan ($75/mo) and the Premium Plan ($135/mo). The plans differ in the terms and features offered, even though, the entire pricing policy is somewhat above the average. All in all, Volusion is a powerful eCommerce website builder, which works great to design quality online stores with top performance and excellent design. You can create small-to-large eCommerce websites with it by making use of the top notch functionality of the system. The service is not quite difficult to use, even though, non-techies may find it complicated. The pricing policy of the website builder is above the average, but the result you will avail when using the service is worth the investment. 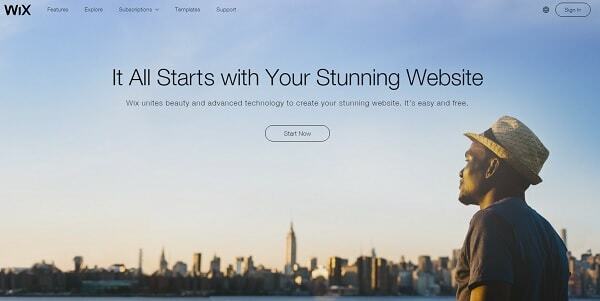 Volusion Website Builder Review – Read the complete Volusion review for more information. Volusion vs Shopify – See the head-to-head comparisin between Volusion and Shopify. How to Create an eCommerce Website with CMS? Hosting Choice. CMS generally don’t offer any hosting and domain options included into the plan. This may trigger the need to look for reliable hosting provided by the third-party companies. To make the right choice, you’ll need to make a profound market analysis to identify the best company to deal with. Domain Name. Just like you need to select hosting, you’ll have to take care of choosing a domain name for your future online store. The domain should be easy-to-remember so that your customers could memorize it with no serious problems. It should also stand out from the crowd, highlighting your business specialization. CMS Installation. CMS may be either web-based or offline. The latter system type requires preliminary download and installation. This is not quite complicated, but this may take some time. Keep that in mind. Plugin Installation. Content Management Systems frequently offer rich sets of features and tools needed to create quality website design. Sometimes, though, they may offer you to install extra plugins that may be either obligatory or optional. These plugins may also be free or paid, but they will surely contribute to your website performance and design. Design. To start working on your online store design, you’ll initially have to choose a template to get started. Just like website builders, CMS frequently come with a collection of themes, which are both paid and free. Paid templates usually feature better quality and customization options as compared to free themes. What’s more, templates offered at no cost may pose danger to your website as they may come with a malware threat. The choice of the suitable template should be based upon the objectives you pursue, when building your online store. If you actually aim at launching a powerful and large eCommerce website, then buying a niche template will be the right solution. Filling a Website with Content. Template choice and customization is only half of the business, when it comes to successful online store creation. Having created the layout and design of your eCommerce website, you’ll need to fill it with content. This is where you’ll have freedom of choice. Take your time to choose texts, images, videos and other elements to be integrated into your website. Payment System Setup. The next step implies the set up of payment options. There are many of them you can choose from and it’s only up to you to decide what payment alternatives you are ready to offer to your clients. The more options you provide – the better. This will eventually affect your customer base and your profit. Shipping Services Setup. Setup of product shipping services is not less important than the setup of payment systems. Before paying for their orders, many clients inquire about the available shipping options they may choose from. Take your time to enlist and specify all the shipping details, the countries you ship your products to, the terms and other nuances. Website Publication. Now that all the problems are handled, it is high time to publish a website. This doesn’t take much time and is generally done with a few clicks. Just activate the “Publish” button and watch the result! The choice of CMS is not less than that of website builders nowadays. It makes sense to make a profound research prior to selecting the service, which will work best for your needs. Let’s have a look at the most popular CMS you can use to start your online store today. WooCommerce is an open source shopping cart plugin, which was developed exclusively for WordPress. It is free to download and install, but you’ll need to pay for some features it offers to manage a WooCommerce online store. The plugin provides a rich set of features at affordable cost, which makes it popular with users. WooCommerce allows creating and running powerful eCommerce websites with advanced functionality. However, some web design skills and expertise might be needed to do that effectively. WooCommerce works well for small and medium online stores. It is highly customizable and can be easily integrated into any WordPress website. Having added it to your online store, you’ll see a brief, but detailed wizard that will help you get started effectively. The plugin offers a set of core features provided out-of-the-box as well as an opportunity to add extensions to ensure advanced website functionality. Among the core features you get for free right from the start, it makes sense to mention mobile-optimized design, digital and physical product sales options, geo-location support, convenient product organization and inventory management, Search Engine Optimization, opportunity to create discounts and coupon codes, numerous checkout options, product reviews and more. WooCommerce offers decent product shipping functionality right from the start. You can use versatile free shipping options, local pickup, flat rate shipping, overseas and local delivery. This means that your customers will have a pretty good choice. There is also an integrated automatic shipping calculator, which allows finding out the cost of order, setting the rates for different shipping areas etc. Having integrated WooCommerce into your WordPress website, you will be offered a chance to buy a premium WooTheme right from the start or try a free Storefront theme. The plugin recommends getting the free theme to those users, who have never dealt with the system before and need some practice. However, if your web design skills are on a decent level and you are ready to start working on your online store, you can try using a WooTheme right from the start. This will reduce the amount of problems associated with application of WooCommerce updates to the website. Right after you make the choice, you’ll be offered to start customizing the website by adding and categorizing the products. There are lots of web design customization options here, which provide multiple web building opportunities. The changes are made and saved immediately. WooCommerce is a free open source WordPress plugin. It doesn’t charge any fees for installation, download or transactions made with it. At the same time, you’ll need to buy hosting for your WordPress website, domain name and some of the paid extensions and add-ons to get the most out of the tool. The cost of these features may be quite high, reaching up to several hundreds of dollars depending upon the choice you make. A nice piece of news is that you’ll need to buy the extensions only once to use them for the unlimited period of time. So, if you realize that your online store really needs them to stand out from the crowd, it makes sense to make the investment. WooCommerce is an affordable and quality solution for building eCommerce websites with WordPress. The plugin plays notable role in boosting SEO and performance of online stores. It comes with a rich set of features that help enhance website functionality. This free open source tool is a nice choice for proficient web designers. Newbies may find it a bit complicated, even though, it comes with detailed tutorials and guidelines. WooCommerce vs Shopify – Read the comparison of Shopify and WordPress (WooCommerce) to see pros and cons of each service. OpenCart is an open source shopping cart, which requires installation and download to be used to the advantage. The program is PHP-based, which often poses problems for users with little or no programming skills. The software is used to launch powerful online stores and is a good start for proficient web designers willing to create large eCommerce websites. OpenCart comes with core features that are enough to build a quality online store, but it also requires installation of extensions to enhance the functionality of websites created with the software. It implies coding knowledge and experience that are needed to set up and maintain a technically-advanced online store. If you lack them, it’s better to look for a simpler option not to face problems with your website management and maintenance afterwards. The software doesn’t have reliable customer support. Instead, they have a $99/mo support plan, which allows solving specific system-related problems. So, if your coding knowledge is insufficient to use this platform, there are lots of other suitable alternatives to go for. Unlike other CMS, OpenCart doesn’t offer an extensive selection of features, but those that exist, are more than enough to launch an online store. However, it is possible to enhance your website performance by using paid add-ons and extensions. Some of the out-of-the-box features include multi-language and multi-currency support, opportunity to manage multiple storefronts and create unlimited listings (products, categories, manufacturers etc. ), reports, availability of modules adding functionality to your shopping cart, numerous backup and restore tools, SEO options, product ratings and reviews, discount coupon system, guest checkout, shipping calculator, recurring payments and more. 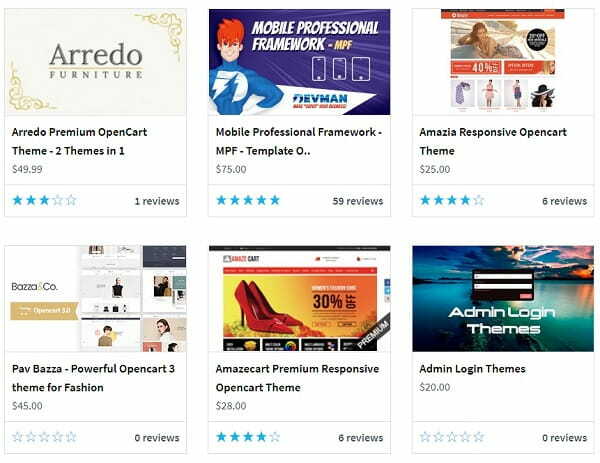 OpenCart doesn’t have its own templates, but it allows using and customizing themes provided by the third-party companies, such as Template Monster and Theme Forest. The collection of templates is pretty large and can be viewed on the extensions page of the program. Template customization requires coding skills as you’ll have to edit the code to get the desired design. If you are not a web designer, you won’t have any other choice but to hire someone, who will complete the task for you. OpenCart is initially free, but this concerns only the installation, download and upgrade of the program. To be able to operate the platform on a high level and get maximum benefits for your online store, you’ll need to purchase extra extensions and add-ons. It is also required to buy hosting and domain name for your eCommerce website to make it available on the web. What’s interesting, OpenCart has released the cloud version of the program. The cost of using it will depend upon the number of online stores a user will create and the amount of disk storage space needed for them. OpenCart is a free open source platform, which allows creating quality eCommerce websites to grow your customer base and generate profit. The software is free to download, install, update and use, but it requires financial investments, if you have an idea to enhance your website performance by purchasing extra extensions. Hosting and domain name also have to be purchased to run an online store here. The system has a nice feature set, but you have to be a web designer to customize your eCommerce website as coding skills are a must here. If you don’t have the experience, then it makes sense to choose a simpler alternative. PrestaShop is an open source platform, which can be downloaded and installed absolutely for free. It is used to build different types of online stores featuring top performance and excellent design. The program, however, is basically created with the needs of professionals in mind. Newbies will find the system complicated. PrestaShop is not a simple program, especially for non-tech savvy users. They may find it challenging to set up and edit modules and solve other technical nuances. Mind that it may take some time to set up PrestaShop as it requires software download, its upload to the server via the FTP client and further installation. Thus, the help of an expert may be needed, if you feel that you lack web design knowledge. PrestaShop offers more than 600 integrated features that cover almost all the needs merchants might have when working on their online stores. Some of these features include an opportunity to create unlimited listings and sell digital products, manage the inventory list, import/export products from CSV files, versatile SEO options, unlimited shipping carriers, estimated shipping, numerous payment options, opportunity to sell products worldwide, setting tax rules for a particular region, real-time analytics, abandoned shopping cart information, customized promotions, automated follow-ups and more. PrestaShop doesn’t have its own templates. Instead, it offers over 2000 responsive website themes provided by the third-party design companies. All of them are paid and the cost ranges between $69.99 and $399.99 for a theme. Quality also depends upon the price. For those users, who wish to test the platform, there is a free template provided by default. As far as PrestaShop is an open source software, template customization mostly implies code editing, but there is also the WYSIWYG editor that can be used by non-experienced people to slightly modify the design of the default theme (add a logo, change banners, fonts, colors, update content etc.). Just like the majority of other content management systems, PrestaShop is initially free to download, install and use. There is also a free demo version here, which allows testing the major system features and explore the admin board and the storefront. If you decide to use the software to build an eCommerce website with it, then get ready to pay for the domain name and hosting. These are obligatory expenses you won’t go without. As to the ongoing expenses, they include the purchase of add-ons and extensions to improve your online store functionality. If you have an intention to integrate your eCommerce website with other platforms like eBay, Amazon, Facebook etc., this will also cost you a certain sum. PrestaShop is an open source software created with the needs of web designers in mind. The platform allows building eCommerce websites, requiring coding skills for proper design customization and performance improvement. Non-techies will find it difficult to use the system, even though, it offers decent result. The software is free, but, if you plan to use it for web building purposes, get ready to pay for extra add-ons and extensions as well as for hosting and domain name. How to Choose the Service to Build an eCommerce Website from Scratch? If a system you come across meets these requirements and seems reliable to you, you can start exploring it to see what it can offer you. Ease of Use. Website builders are easy to use. This feature makes them a nice choice for non-tech savvy users as well as for web design pros. They ensure quick and effective web design process and come with easy web editors that reduce the web building hassle to the minimum. As a result, you can create a decent website in less than no time. Template Collection. Most website builders have rich template collections, which include free and paid themes. They are often divided into categories based on the niche they belong to. Many templates are responsive and mobile-optimized to ensure maximum exposure. Design Customization Tools. Just like website builders offer multiple website templates, they also offer a variety of design customization tools. They allow creating any design you need in a simple and intuitive manner. Affordability. Website builders are much affordable as compared to many other web building tools. Many of them have free unlimited versions, while others offer free trials to let users test the system features prior to making the choice. Paid plans are generally reasonable to meet diverse needs and budgets of users. SEO Optimization. Projects created with website builders are optimized for the search engines right from the start. You just need to fill out the meta-tags, titles and keywords to ensure maximum SEO promotion. Code Editing Restrictions. As far as website builders are created with the needs and skills of average users in mind, many of them come with code editing restrictions. As a result, websites look a bit similar and have almost the same structure defined by the template. Lack of Functionality. Website builders are good enough to allow creating simple projects devoid of extra functionality. This may not be enough, if you wish to design a powerful project to meet your business or personal needs. Lack of Website Transfer Options. When you decide to launch a website with a website builder, you should know that you won’t be able to migrate the ready made project to another platform, no matter what objectives you have. Rich Feature Set. CMS usually offer more extensive feature sets as compared to website builders. This allows creating full-featured online stores to attract the attention of clients and maximise profit. Affordability. The prevailing amount of open source CMS are absolutely free. You don’t have to spend money to download and install the system you like, but get ready to pay for hosting, domain name and extra extensions (plugins), many of which are optional. It’s up to you to define the budget you can spend on your project development. Powerful Customization Options. Apart from a rich feature set, CMS generally come with powerful customization options, which cover almost all web design needs. It is easy to create website design by installing and changing the plugins. Quick Web Development Process. Building an eCommerce website with CMS doesn’t take much time. Even if you are not a web design expert, you’ll cope with the task in several days by integrating plugins, customizing templates and using modules. Coding Skills. CMS are more complicated than website builders in terms of technical skills. Newbies won’t be able to use these services to the advantage without preliminary learning and service exploration. Coding skills and experience are needed to edit website codes, customize website design, integrate plugins, update and manage content, adjust settings. Insufficient Customer Support. As far as CMS are mainly oriented on web designers, they don’t pay much attention to customer support. Some of them offer tutorials and manuals to help a user learn basic system features, while others are not ready to provide direct customer support. As a result, newbies may waste effort and time trying to cope with website-related problems on their own. What web building service works best for your eCommerce website? This is a controversial question that can be answered in different ways. If you have ever been involved in website building before, intend to create a large online store with excellent performance and are ready to fight with the difficulties of the web building process, then it makes sense to choose CMS for this purpose as these systems provide more advanced features to ensure top notch result. However, if you are just starting your business and wish to establish reliable web presence for it, then it is better to give preference to a website builder. These systems are specially created with the needs of non-techies in mind and, thus, they provide versatile options to help you get started with your online store in a quick and hassle-free way. Take your time to analyse information the post provides to make the right choice.